Camel trains arriving at a city gate; the distinctive architecture of the Forbidden City, its pagodas, imperial buildings and temples; Manchu fashion, the Empress Dowager and the child emperor Puyi; street performers and foreign tourists&#x2014;all come to life again in this extraordinary collection of rare and vintage postcards. 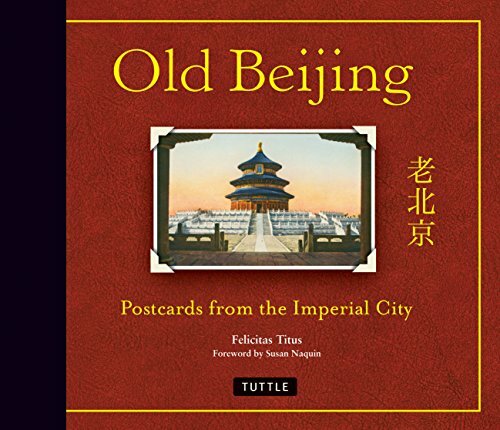 Old Beijing: Postcards from the Imperial City offers a unique look at a vanished China and its storied capital. Comprising 355 black-and-white and hand-tinted cards that span the period from the last years of Imperial China to the Japanese invasion of 1937, it is a treasure trove for historians, collectors, Sinophiles, and anyone fascinated by people and cultures from times past. <b>Felicitas Titus</b> grew up in the foreign concession in Hankow, China, under Chiang Kai-shek, at a time when traditional Chinese culture still ?ourished. She visited old Beijing, then known as Peking, as a child and later studied there for two and a half years, during World War II. After leaving China in 1949, she moved to the United States, where she still lives. Payment through Abe Books only.